This newly constructed waterfall has split streams to make the feature wider and more interesting. Add trees and shrubs around a built up water feature to balance the height in a flat yard. Be creative all the way around a waterfall. We used walls, steps, and a bench to give this just completed project more interest from another angle. Many people dream of having a backyard waterfall, so I decided to make the focus of this tips article about basic waterfall designing. As an avid user of Pinterest, many of my ideas for articles in this tips section are from things that I see in my searches. After a recent search for backyard waterfalls I found some stunning pictures, and some not so stunning ones. The reason why some are not so stunning is what we want to talk about. Ultimately, it is about what you want as a homeowner, but there are still a few things to keep in mind that can help you achieve a better look. It seems that people want the biggest, and tallest waterfall they can build. Maybe this has something to do with our obsession with skyscrapers? So let's do a quick comparison. If you stuck a 100 story tall building in the middle of a small town, it would look out of place. It would be out of proportion with the rest of the buildings. If we put that same building downtown Manhattan, it would just be another big skyscraper to look at in amazement. The difference is, the other buildings around it are large as well. This puts the building in a sort of “balanced” state with the rest of the skyline. When you build a waterfall in your backyard, there is only so much height that is acceptable before your beautiful waterfall actually becomes an eyesore. It has to be in balance with the surroundings, and in the right proportion with the yard. This is done easily and naturally with a sloped yard, but becomes a challenge with a flat yard. A three or four foot mound of dirt for building a waterfall in the middle of your yard may not be the right plan. A stack of rocks in the corner is a little more balanced with the height of a fence, but this also has limitations that your eye will pick up on. 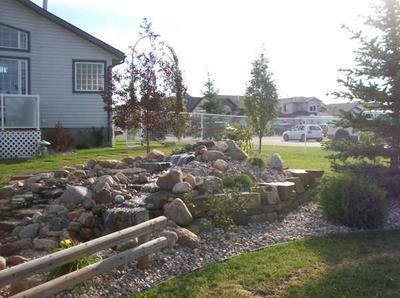 A small yard can usually only accomodate a certain size of water feature. The three pictures above are a good example of building up a water feature in the center of large, but relatively flat yard. We used what little slope we could, and added some trees and shrubs around the project. These pictures were taken just after completion and the plants will eventually mature and add color to the feature. The customer initially had considered a higher waterfall, but the flat yard would only accommodate so much height. We did make it a little wider by splitting the water into two streams due to the yard size. Each side is different. One side has cascades, while the other was more like rapids. The rocky look is something I leave to the customer. Lots of boulders, flagstone, rubble, mixed, etc.. This is a matter of personal preference. The small wooden fence and the barrel were left over from a previous feature, but had sentimental value to the customer so we incorporated them into this project. It is a pondless feature so we cut a hole in the barrel to have the stream dissapear into it. More plants are still to be added around it. The stone bench was added as a nice spot to sit and listen to the peaceful sound of water. Because this feature is in the middle of the yard, we gave it a unique look from each angle around the project. Stairs and a small wall on one side, and large boulder rocks on the other. Now that we have talked a little about it, here is a great way to start. Browse the pictures of waterfalls with height, balance and proportion in mind, and you will see what I mean. Keep in mind that what may look out of place to me, may still look OK to you. We all have different taste, style and design ideas. The idea is to develop an eye for what you think may look, and work best in your yard. I would suggest using the search bar on Pinterest for “Backyard Waterfalls”. Look at which waterfalls use the slope properly, and which ones fight the yard. Also note the features, trees, plants and shrubs around the yard that balance the height. A few things you can do to build a higher waterfall effectively. Don't fight with the natural slope of your yard. This is one of the biggest mistakes made. Water never flows uphill. Even the slightest slope will work to your advantage if you use it right. 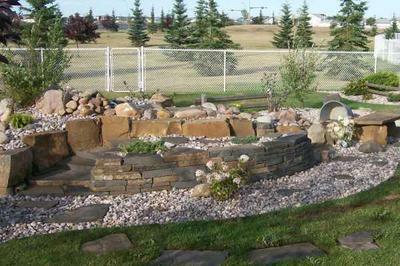 Build in succession, or regrade your yard to slope up to the waterfall feature. If everything is flat but the waterfall, it won't flow with the rest of the yard. Use plants, shrubs and trees effectively to give height around the sides and back of the water feature. When you build a water feature in the middle of the yard, try to make it interesting from every angle. Blend colour to eliminate a contrast from your waterfall feature, to the rest of the yard. What we mean by this is, a big pile of grey rocks in the middle of a large green lawn doesn't look natural. Plant in and around the waterfall to soften the look of the rocks you use. So these are just a few simple tips to help guide you with your design for a backyard waterfall. 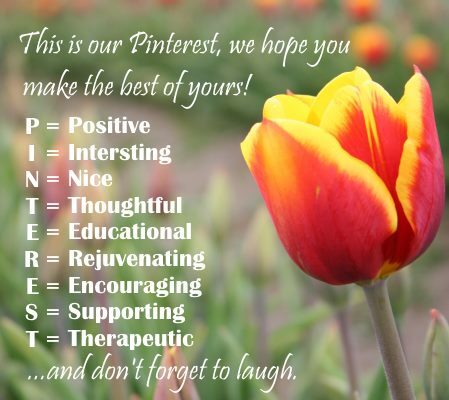 We hope this helps get you going in the right direction.